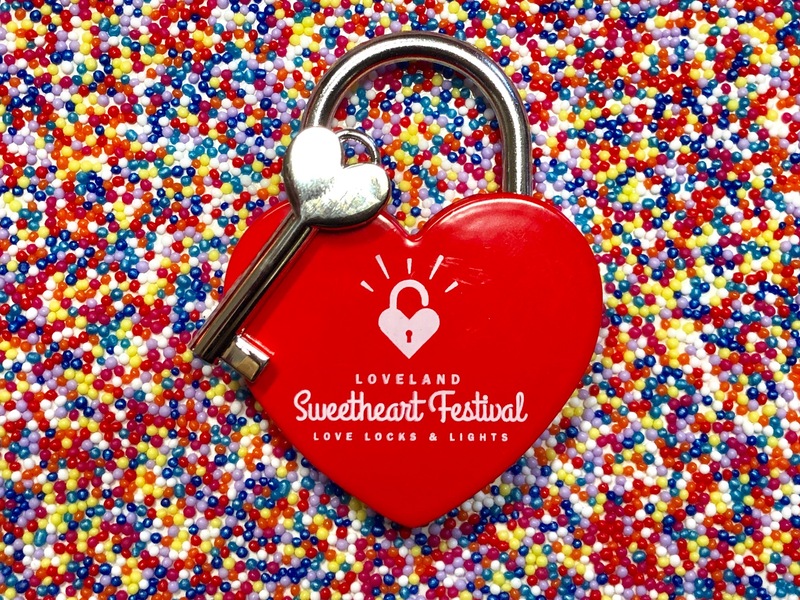 Loveland, the nation's Sweetheart City, just got a little sweeter for lovers thanks to its Love Lock Sculpture and inaugural Sweetheart Festival. Love love? In awe of amor? Revel in romance? Now, you can take part in a traditional custom and declare your love in Loveland, just in time for Valentine's Day. The city has unveiled Colorado's largest, and one of the nation's largest, love lock sculptures. 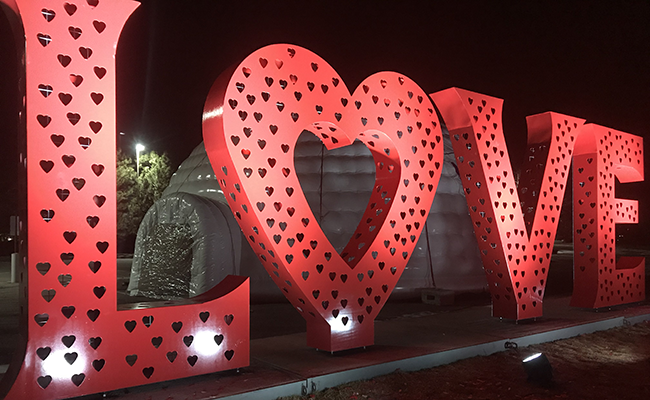 This 24,000-pound, 10-foot tall, 30-foot-wide sculpture is made up by the union of four sculpted letters; L, O, V, E.
Lovebirds can buy a lock for $10 or bring their own lock and put it on the sculpture and throw away the key as a symbol as their forever, unbreakable love. The love lock tradition is believed to have originated in ancient China and has been practiced all over the world. The Pont des Arts bridge in France is one famous location that lovers have locked down their love. "Whether you keep the key as a souvenir or throw it away to lock your love for eternity is up to you," says VisitLovelandCo.org. It also encourages you to share your love on social media. "Tag #visitloveland and #lovelandlovelocks in your photos to show the world that you have locked your love!" The sculpture was a labor of love for local sculpture Doug Rutledge and Beatty Construction (manufacturer) and Loveland Ready Mix Concrete (cement services). This lovely piece has been installed at the Loveland Visitor Center and is visible from US 34 for all to stop by and visit. You can make the pilgrimage most any time of year, as the sculpture will be available year-round at the center. The only exceptions are Feb. 14 when it will be moved to the Budweiser Event Center and Feb. 8-9 when it will be the star of Loveland's first-annual Sweetheart Festival! The Sweetheart Festival - Love, Locks, and Lights brings together Loveland's 70 years of experience embracing sweethearts near and far. The event will feature art displays, a chocolate and beer tasting, laser shows, bands, fun for kids, as well as a Little Miss Valentine and Little Mr. Cupid contest for the wee ones. Check out VisitLovelandCo.org for more information on this fun event you're sure to love. And don't forget that you can send mail with love to Loveland's Valentine ReMailing Program to have a letter sent to any person in the world (where mail is delivered) complete with a hand-stamped, unique Valentine's verse. Bald eagles will fly high in Colorado through March! Click to learn more.